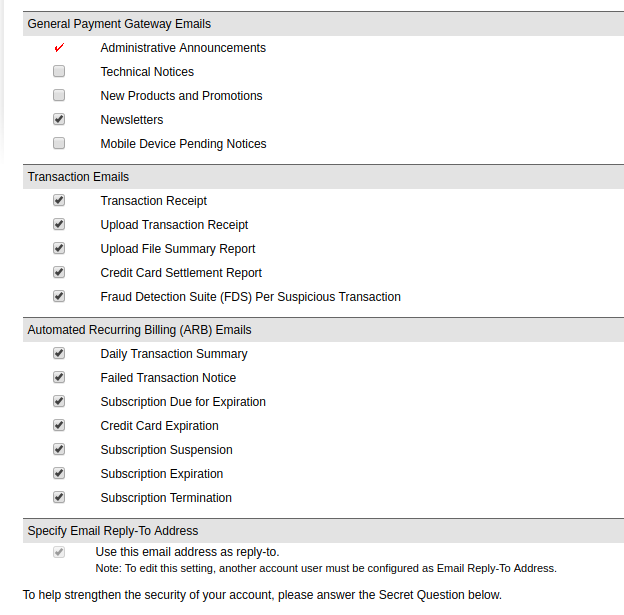 You can configure your account to get emails from Authorize.net when any of a number of things happen: a new charge is made; a batch is processed; etc. You find those settings by logging into Authorize.net (https://account.authorize.net), then navigating to Account -> User Profile and clicking on Edit Profile Information. Once you click on Edit Profile Information you will see a list of all the available email notifications you can receive. Simply check / uncheck your selections and then update your settings. Note: To update your settings you will need to enter the answer to your Secret Question. This was provided to you by us when your account was first set up.